Zimbabwe's government says the country is emerging from a recent economic meltdown that saw shops run out of goods and motorists spend long hours in lines at gas stations. Economists say Zimbabwe's crisis is not over, as people have no confidence in the currency or in President Emmerson Mnangagwa's government. For weeks now, there have been long and winding queues at most fuel stations in Zimbabwe, as the precious liquid has been in short supply. Lameck Mauriri is one of those now tired of the situation. "We are really striving but things are tough to everyone," said Mauriri. "I do not know how those in rural areas, how they are surviving, especially if in Harare it is like this. We are sleeping in fuel queues. There is not fuel, there is no bread, there is no drink. There is no everything. No cash, no jobs." For a decade, the country has been without an official currency and relied on U.S. dollars, the British pound and South African rand to conduct transactions. In the past three years, however, all three currencies have been hard to find, paralyzing the economy. The introduction of bond notes — a currency Zimbabwe started printing two years ago to ease the situation — has not helped. 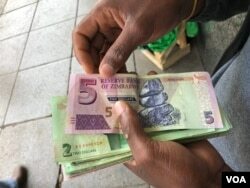 The bond notes were supposed to trade at par with the U.S. dollar; but, on the black market, a dollar now is now equal to close to three bond notes. Prosper Chitambara, an economist of the Labor and Economic Development Research Institute of Zimbabwe says the bond notes are partly to blame for the price increases and shortages in the country. "What is lacking in the economy, in the market is confidence. There is a distrust of the formal economic system," said Chitambara. "The bond notes have definitely contributed a great deal to the current economic situation, a fallacy economic situation. What they have done is for example to increase money supply in the economy. And that money supply is not actually backed by significant productivity in the economy. That actually gives rise to general of inflationary pressures." 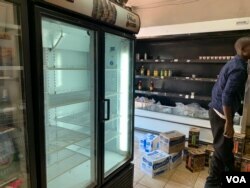 He said the government's recent introduction of a 2 percent tax on all electronic transactions pushed prices even higher and caused some shops to close. Ndabaningi Nick Mangwana, Zimbabwe's secretary in the Ministry of Information and Publicity, says the situation in the country is normal and there is no need for alarm. "There is no shortage to oil itself, there is no challenge in terms of production of all these essential services," said Mangwana. "That is why they are there if you go. There were a few people who panicked, closed a couple of shops, but those opened within hours. There was fake news and people panicked, but it is all under control." That is not exactly what seems to be the case on the ground. Some shops remain closed and prices continue rising. Long fuel lines remain the order of the day.